Many children struggle to read “quickly, accurately, and with proper expression” – essentially the definition of reading fluency. In order for your child to truly comprehend information that he or she reads, fluent reading is essential. Typically, children who are able to read accurately but not fluently tend to expend more energy when reading and read less than their peers. As a result, these students often do not enjoy reading for pleasure, negatively affecting their language and vocabulary skills. A research study that analyzed the correlation between reading fluency and reading comprehension found a significant relationship between oral reading fluency and reading comprehension performance (Pinnell et al., 1995). Thus, according to this study, students who have weak reading fluency skills tend to also have weak reading comprehension skills. State tests and nearly all academic aspects of school integrate reading comprehension. Developing reading fluency and, as a result, helping to foster reading comprehension, is a key component to school success. How can you help your child develop better reading fluency skills?‎ Try practicing the strategies described below. 1. Have your child read the passage out loud as a cold read. 2. You read the same passage aloud to model proper reading fluency. 3. 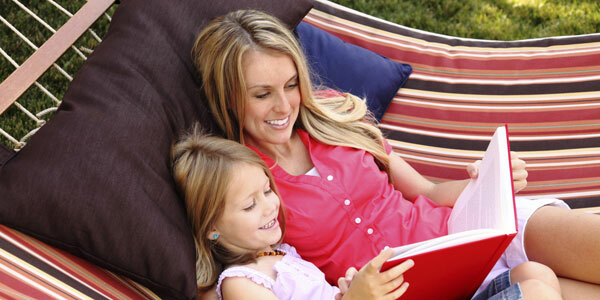 Your child reads the passage out loud *with* you, trying to keep up with your pace. 4. Your child reads the passage out loud again alone, noting the difference between this read and the original cold read. Several research-based programs are designed to build reading fluency and can be used by parents at home. Great Leaps is one such evidence-based program, consisting of timed readings of phonics word lists, sight phrases, and stories. The reading is done in the form of one minute timings for 5-10 minutes per session, ideally three or more days per week, on a one-on-one basis. The goal is for the child to read each page with no more than two errors. When mastery is achieved on a page of words, phrases, or a story, the child “leaps” to a higher level. Fluency practice with sight words is also integrated into the Great Leaps program. Sight words that are commonly misread, such as of, off, them, these, from, etc., are included on the lists. For the stories, students learn proper intonation and build overall reading fluency skills. After each reading, the student’s progress is monitored using the Great Leaps Reading Progress Charts. Students are often motivated by seeing their words-read-per-minute scores increase. Kits are available for each level on the Great Leaps website, including a teacher’s manual, phonics probes, sight word lists, and passage selections. The more you can help your child build his or her reading fluency skills with exercises like the ones described above, the easier reading will become, and the more pleasure your child will find from reading.